Book a journey on our free community bus to visit two different locations and enjoy a variety of fun activities and entertainment. All activities include a lunch and afternoon tea. Click on the timetable below to select your program, note the bus number and phone the participating Community Centre to book your seat. You may also choose to participate in only one of the activities or create your own schedule and use your own transport. Please note that activity bookings are still required for those not traveling on the bus. 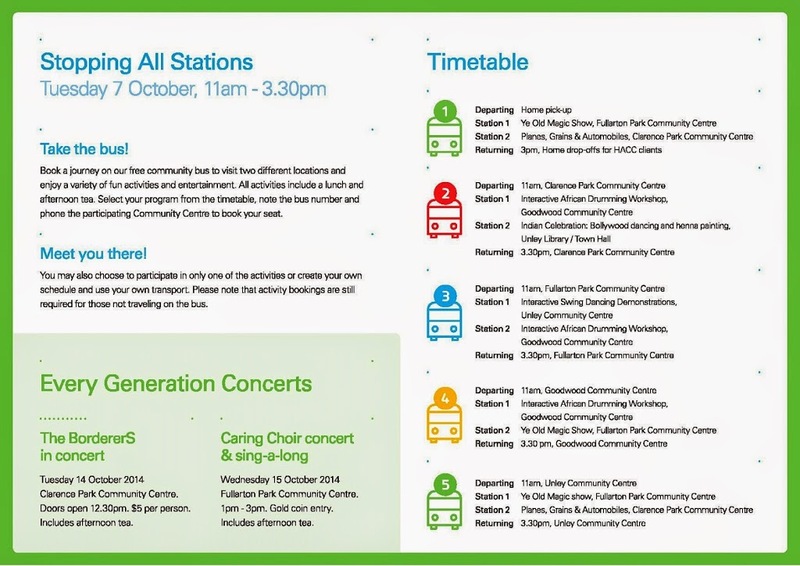 Clarence Park and Fullarton Park Community Centres are also hosting special concerts to celebrate the Every Generation Festival. Phone the relevant centre for individual activities or concerts. Phone the departing centre to book a seat on a Stopping All Stations bus. If You Aren’t You Know Someone Who Is.